First things first- this post was supposed to be up this morning but IT IS A FREAKING MAD HOUSE around here. There is no more control around here. There is no more pretending like there is any kind of control. It's just chaos. So I'm running with it! On top of this we have a big market/craft show going on in Salt Lake that we had to set up for Tuesday night and for which we will have to restock tomorrow. It's wild! So wild! So many earrings! But we are happy and grateful and loving this crazy life we've made for ourselves! AND to throw one more kink in their my AP kids take their AP test in 6 days. So I'm a nervous wreck/ chicken with its head cut off when it comes to school. I feel like more of my attention and focus is required at school then ever and they when I get home I just totally switch gears to jewelry/ business/ orders. But THAT'S WHY this blog has gotten the shaft. I love you, blog! But I don't have time for you anymore! But I'll never desert you! But you might have to wait around for me sometimes! Sounds like any healthy relationship, right!? In any case, today (Thursday) was supposed to be book club post! For Bon's Book Club. And while I'm talking candidly with you here, can I just say that I hate the name "Bon's Book Club"? I feel so lame whenever I say it. Like I think I'm Oprah or something. I don't think I'm Oprah. And I'm open to suggestions for name improvements. Fire them at me! 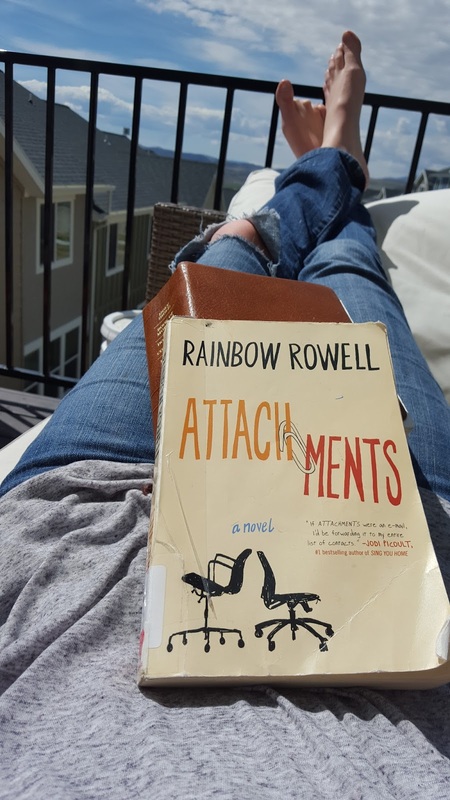 April's book was Attachments by Rainbow Rowell. Going in I had VERY low expectations because I really really didn't like Eleanor and Park which is another book that she wrote. We read that book last year for book club and it was whiny, angsty teenagers and I kind of felt like, "duuuuude, I get enough of this at the high school k bye." That was mostly why I didn't like it. Also very slow/ no plot. Here's the whole review if you care. Mostly you just need to know I didn't like it. So my expectations were low going into Attachments which I have found to be the secret to enjoying anything in life. HAVE LOW EXPECTATIONS! Dash your hopes and then dash them again and suddenly everything good in life is a bonus. This book was definitely a bonus for me. The book is written via "attachments" to emails. It's two women at work who write each other at their boring jobs and talk about life, work, boyfriends, etc. They don't know that their emails are being "flagged" and some guy downstairs is reading them monitoring for inappropriate content. Well, he kind of falls for one of the girls but doesn't dare ever talk to her or meet her because of crippling anxiety and shyness. Until he does talk to her. And then they make out in a movie theater. + Emails between the two girls. Very funny and very witty. I could read those all day and be entertained as can be. I normally am not too fast of a reader (I tend to get distracted by everything in the world around me. I'm working on it.) but I read this book in two days. This is VERY unusual for me- probably happens once a year. Usually it takes me at least a week or two to read a book. Attachments was such an easy read, though, and so fun and clever that I just flew through it. + I thought the character of the main guy, Lincoln, was shyly adorable, very unassuming, and just overall sweet, quiet guy. Not like most of the leads in books which was kind of nice. + I really enjoyed the character of Lincoln's mom. A lot of the girls in our IRL book club didn't like her because she was overbearing, protective, couldn't let go of him, clingy, etc. I liked her though. I thought she was out of control and hilarious and way too involved in her son's life, AS MOMS ARE. So I really appreciated that character. + Just an overall very fun book for me to read. This is a perfect summer/ beach/ vacation read. You don't have to focus or remember a lot of plot points or characters. PERFECT. It's like watching a cute little chick flick, but you're reading it. + As was brought up in our IRL book discussion, I wished there was more physical description of the characters. It wasn't until halfway through the book that Lincoln is referred to as "my cute guy" and I was like, "WHAT?!? He's cute?!? This changes everything!!!" I also didn't feel like with Beth and Jennifer we got much physical description either. Of course, everything we learned about them was through email, so it makes sense. + Sometimes I felt like Rowell was just making up "fake problems" to get in the way of Beth and Lincoln being together. There didn't seem to be any real hurdles and so it was frustrating when chapter after chapter they weren't together because Lincoln was quiet or because Beth was talking about her boyfriend again whom she didn't like. I dunno. I kind of needed a little more conflict. + It took so long for Beth and Lincoln to finally hook up and then when they did, the book was over. I hate it when books and movies do that to me. I invest a lot into watching these two get together, now I would like to see what it is like when they are together a little more! Give me a few chapters of lovey/ dovey adorableness. Don't do me wrong! Overall I give the book 4.5 stars out of 5. Very cute, fun read. You're not going to be up all night thinking about it, but it is great for an entertaining read. Also a great book to give someone who is a reluctant reader. Read it this summer! And for those of you who read it, tell me what you thought? Anybody else read a lot of Rainbow Rowell's book and have suggestions for which ones I should try? (I heard Fangirl is not too great?) And for May we are reading Jodi Picoult's Nineteen Minutes so get ready for drama because you know how Jodi Picoult likes to do us. Discussion will be the last Thursday of the month (May 26) and IRL book meet up will be that Tuesday, May 24. See you then, suckers! Book club is my favorite night of the week. I love it soooooo much. Come join us! Email me thelifeofbon@gmail.com for details and such. Or click here for 2016's reading schedule.